Having sensitive eyes presents something of an uphill battle when it comes to makeup. You want to wear your favorite products, but the potential for stinging, watery, and reddened eyes makes you shy away from enhancing what many women feel is their best feature. Get ready to play them up though, because there are ways to minimize the potential for your eyes to react to makeup, and they’re easy adjustments to make. When eyes are extra sensitive and prone to watering, you must be diligent about checking ingredient lists for all the eye makeup you’re considering. First, make sure that the formulas you’re using are gentle and free of irritants. A surprising number of eye-area products (including mascaras, eyeshadows, and eyeliners) contain potentially sensitizing ingredients, such as fragrance, “hidden” fragrance ingredients like ethylene brassylate, and denatured or SD alcohol. These greatly increase the potential for eyes to react. If you prefer foundations or concealers that contain sunscreen—which is a great way to get extra protection from UV light—choose formulas with the mineral actives titanium dioxide and zinc oxide. Although synthetic actives like avobenzone and octinoxate provide great sun protection, they also can irritate sensitive eyes when applied right next to them. Mineral-only sunscreen formulas are gentle on the eyes, so they’re the best way to go. We know it’s difficult to toss out makeup products, but the reality is that some of them need to be replaced on a regular basis. Mascaras and eyeliners should be thrown out between three and six months after opening because they can dry out or go “off” more quickly than powder-based products like eyeshadow. Mascaras and liquid liners also collect germs, which is less than ideal for sensitive eyes. It's also helpful to be consistent about routinely cleaning the makeup brushes you use around the eye area. Don’t worry, you don’t have to wash them every day; in most cases, once a month is good enough. We have some helpful tips on how best to clean your brushes so you can get through this chore quickly and efficiently. A critical step in taking care of your sensitive eyes comes at the end of the day. Always remove your makeup completely to make sure your eyes aren’t at risk for puffiness or redness the next day. 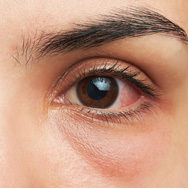 Mascara and eyeliner have a greater chance of migrating into eyes if you have them on while you’re asleep, pushing them further into skin and the eyes themselves as you toss and turn. Since many people with sensitive eyes prone to watering tend to use waterproof formulas, make sure you have a gentle, fragrance-free makeup remover that’s strong enough to remove waterproof makeup without the need for rubbing or pulling at the eyes and eyelashes. In this case, how you finish is just as important as how you start!